For the past few weeks I’ve been battling Benefit Cosmetics “Roller Lash” and Maybelline “Lash Sensational” both of which are the latest mascaras from each company. I was seeing ads for these two mascaras everywhere and I knew I needed to get my hands on them. I was particularly excited for Benefit’s “Roller Lash”. First, both mascaras applicators are fairly similar. They’re curved and they have fine teeth to grasp lashes. Although, the Maybelline applicator is chubby whereas the Benefit applicator is thinner. At first, I thought these two were similar in the way they made my lashes looked but upon further inspection I realized “Roller Lash” really takes the ‘feather effect’ to a whole new level. As far as application goes… that’s a tough one. Some days “Lash Sensational” was super messy and would flake, other days it would apply beautifully and not flake. “Roller Lash” is tricky, for instance layering. Sometimes when I would try to layer coats of the mascara on my top lashes it would clump all of my lashes together. I’m talking like I had 8 lashes total on each eye. It was terrible. 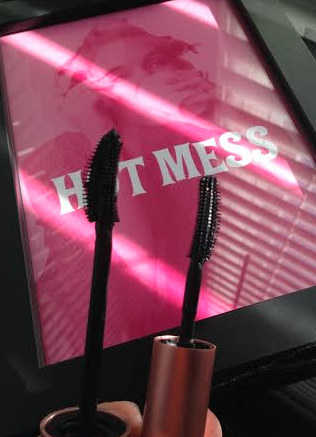 I soon realized it was because I like to put mascara on both the bottom and top of my top lashes… if that makes sense. I quit doing this, and now it’s beautiful every time . “Lash Sensational” can clump when layering, but it wasn’t as drastic as “Roller Lash” in my opinion. “Roller Lash” claims to lift and curl lashes better is spot on. There’s no arguing that. Plus, I noticed with “Lash Sensational” my lashes wouldn’t seem as…. perky after a few hours. “Roller Lash” also claims to make the eyes look bigger and more open and in the side by side photo you can totally tell it’s true. Price point is clear on this one. “Lash Sensational” is cheaper than “Roller Lash”. Obviously. “Roller Lash” retails for $24 and “Lash Sensational” is $8.99 depending where you buy it. I kept going back and forth with the winner of this Battle of the Brands because I honestly liked both mascara’s. It wasn’t until last week when I decided completely which mascara I liked better and which I think is better. That mascara is……. Honestly, as much as I liked “Lash Sensational” it didn’t seem to do anything that wow’d me. It just felt like a usual mascara I had in my collection already. I was amazed at how different “Roller Lash” was for me. It grabbed small lashes I didn’t even know where there! Not only that, but it really made my lashes look so full and feathery. “Roller Lash” is definitely worth the money. Have you tried these bad boys yet? Let me know what you think! This entry was posted in Uncategorized and tagged Battle of the Brands, beauty, beauty blog, beauty blogger, benefit, benefit cosmetics, benefit roller lash, BOTB, comment, cosmetics, fashion, follow, fun, happy, Lash Sensational, Lash Sensational review, love, make up, make up blog, make up blogger, maybelline, maybelline lash sensational, Review, Roller Lash, Roller Lash review, style, suggest, The Modern Lady, The Modern Lady's Guide. Bookmark the permalink.